We often end up munching on those sweet-tasting raisins while our moms are busy cooking up delicious desserts. 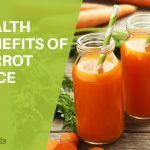 Though you might love them for their sweetness and texture, they actually have a hell lot of benefits which you are quite unaware of. Other then its benefit of being an alternative for something sugary, these dried grapes can guard your body from a number of diseases and disorder. I know it sounds quite surprising that these tiny snacks can have such huge benefits, so we have decided to bring you all the low down on this. Sit back, relax with a bowl of raisins and go through this post because the next time you crunch on them it would be more like a healthy snack for you! If you are looking for ways to control your blood pressure and lower it as required, then raisins is the way to go. Studies have proved that you just need to consume raisins three times a day over a period of time. You can also lower the risk of a stroke by consuming raisins. With high content of soluble and insoluble fiber, raisins are effective in maintaining a healthy digestive system. Including raisins in your dishes is an ideal way to increase the intake of fiber in your body since a cup of raisins consists about 7 grams of fiber. ‘Don’t eat sweets, you will harm your teeth and gums!’ How many times have you been told this? A lot of times, right. The next time you want to indulge in some sweets without causing any harm to your gums and teeth, just have some raisins. 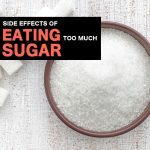 Though it is sweet and sticky in nature, it can actually inhibit the growth of bacteria that cause oral health problems. This is due to the content of antimicrobial phytochemicals. Now you can have your sweet without worrying about cavities and tooth decay. 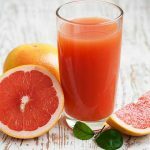 The growth and spread of cancer cells is primarily due to the free radicals and in order to curb them, your body needs effective antioxidants. This is why raisins are considered as a natural remedy for treatment of cancer since they can increase the levels of antioxidants. Certain researches have proved that raisins are beneficial for type II diabetic patients. Raisins can reduce the levels of glucose, fasting glucose and systolic blood pressure. It is also helpful in preventing insulin spikes, which is why raisins are considered as a natural remedy for diabetes. Constipation and diarrhea are two bowel disorders that can make any sane person go crazy. Raisins are quite effective in providing relief from both of these disorders. The fiber content makes it easier for food to pass through the intestinal tract. It can control diarrhea by absorbing the liquid of the loose stools, thereby reducing its frequency. Looking for ways to stimulate your libido and increase your levels of sexual endurance? Then try consuming raisins as it has been proved that raisins can effectively take care of your sexual problems since it contains an amino acid called Ariginine. Raisins are what you should indulge in if you want to gain weight without unnecessarily increasing your cholesterol levels. You will often find raisins as an integral part of an athlete’s diet because they help in gaining weight in a healthy manner. Raisins consist of glucose, fructose and a lot of nutrients and proteins, all of which give your body a healthy boost. Acidosis is a condition in which the levels of acidity in your blood or the gases in your respiratory system increases. The increase in acidity levels can adversely affect our bodies and consuming raisins is an effective of combating this condition. Raisins are a great source of carbohydrates and are hence considered to be an important snack while indulging in workouts and endurance sports. It is often deemed as an energy booster. Potassium content in our body is vital since it is responsible for stimulating nerve impulses and muscle contractions. Along with that it also helps in regulating the heart beat. Raisins are rich in potassium and are perfect in meeting the daily required levels. Raisins will not only help you in reaching the required levels of potassium but also iron. We women need 18 milligrams of iron everyday which can be easily achieved by eating raisins. Your immune system, metabolism and making of amino acids all depend upon your body’s iron content. So you nerd to ensure that your iron intake meets the required levels. Just like potassium and iron, there is a certain level of required fruit servings too that your body needs. And one of the best ways to accomplish that is by having some tasty and yummy raisins. Raisins make for the perfect snack items and you can easily carry it everyday in your bag with you. We are sure you weren’t aware that raisins could help in preventing your skin from sagging! The skin system can be effectively repaired and the skin cells can be rejuvenated with the help of antioxidants which are present in raisins. Resveratrol is the substance which removes all the toxins and impurities from your blood, thereby making your skin healthy, shiny, clear and nourished. For a healthy and strong vision, you need vitamins A, A-Carotenoid and A-Beta Carotene which is abundantly found in raisins. 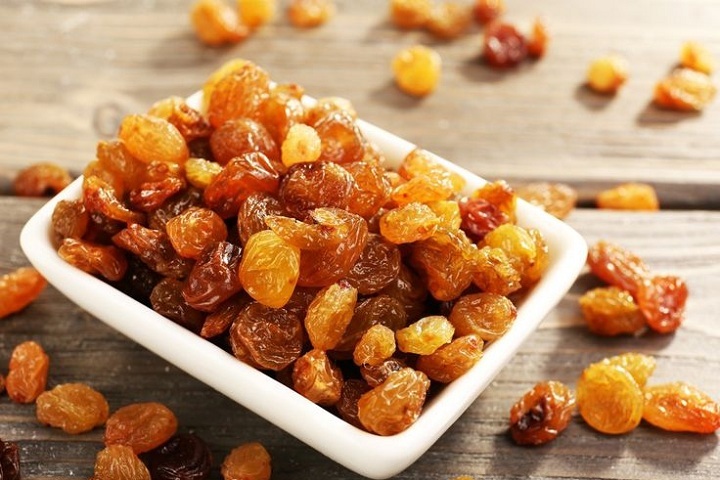 The polyphenolic phytonutrients present in raisins will help your eye from disorders like cataract, weakening of eyes due to age and macular degeneration. Raisins can fight against bacteria and viral infections which in turn will help in curing fever. 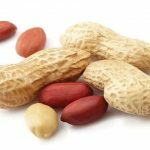 They contain phenolic phytonutrients which have antioxidant, antibiotic and germicidal properties. Here is a weird raisin fact which will surprise you. While eating raisins, the longer they remain stuck to your teeth, the better! Sounds weird right. This is because it consists of oleanolic acid which can protect your teeth against tooth decay, dental problems and cavities. We all know that we need calcium to keep our bones healthy and strong, but we were definitely not aware of the fact that raisins also contain calcium. 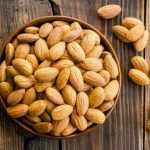 Along with calcium, it also contains a micro-nutrient called boron which prevents osteoporosis and take cares of bone formation. 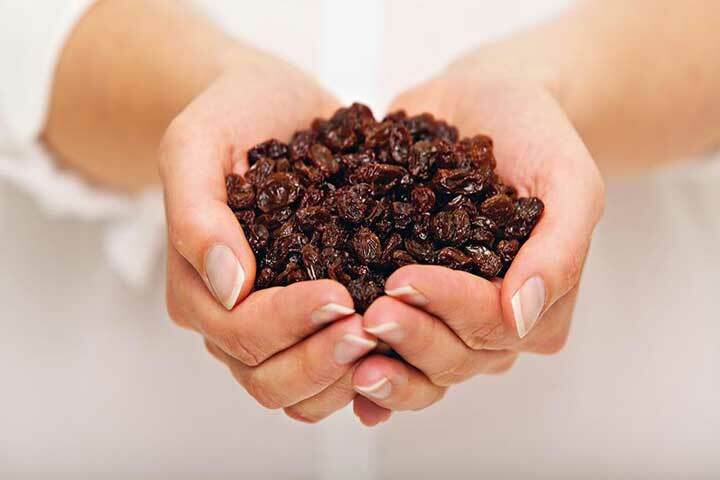 People suffering from anemia should include a good dosage of raisins in their daily diet. With high contents of copper, iron and vitamins, raisins are the perfect remedy for treating anemia. Fine lines, blemishes and wrinkles; say good bye to all of them with the help of raisins. Phenol is the antioxidant present in raisins which can prevent the skin cells from getting damaged. It delays the process of aging by taking care of collagen and elasticity of the skin. Also, it ensures that all the care is happening from inside rather than outside.